Coverage of the British Athletics Cross Challenge at Sefton Park in Liverpool can be found here, while other recent highlights are below. 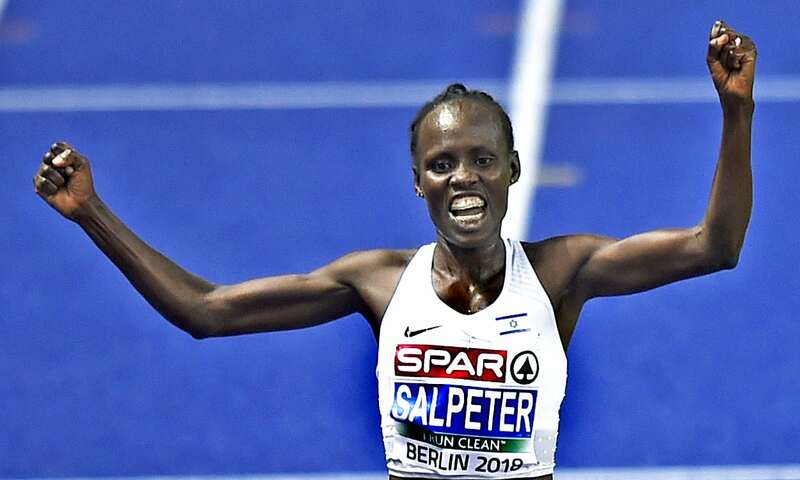 European 10,000m champion Lonah Chemtai Salpeter clocked 2:24:17 (72:38/71:39) to greatly improve on her previous marathon best of 2:40:16 from Berlin in 2016 and also break the course record (which was 2:28:15 from 2002) and Israeli record (which was 2:35:59 from 2016). It is a European-leading marathon time for 2018 and saw Salpeter finish 10th overall, winning the women’s race by more than six minutes ahead of Kenya’s Caroline Chepkwony (2:30:46) and Rwanda’s Clementine Mukandanga (2:30:59). Bahrain’s Ali Abdi Gelelchu won the men’s race in 2:11:32 on his debut ahead of Morocco’s Hicham Boufars (2:12:16) and Kenya’s Gilbert Kirwa (2:13:08). Ciara Mageean and Kevin Dooney won their first senior Irish cross country titles at the Sport Ireland National Sports Campus. Mageean clocked 28:02 for the 8km race to hold off Annmarie McGlynn with 28:05 and Fionnuala Ross with 28:08. Mageean now holds national titles on the track, both outdoors and indoors, as well as cross country. Leevale won the team race led home by Michelle Finn in fourth, with Letterkenny second and North Down third. In the men’s 10km race, Dooney won in 30:07 to hold off a fast-finishing Sean Tobin with 30:11 and Kevin Maunsell with 30:18. It was double delight for Dooney as he helped Raheny Shamrock to three national team titles in a row. Clonliffe Harriers were second with Clonmel third. Sarah Healy and Darragh McElhinney won the combined under-18 and under-20 races. Annie Naylor of Notre Dame High School in Sheffield won the inter girls’ race, while the inter boys’ title was claimed by Alex Thompson of Ermysted’s Grammar School in Skipton. The team competition was won by The Coopers’ Company and Coborn School in Upminster for the girls and The King Edward VI Academy in Morpeth for the boys. There was a junior individual double for Dr Challoner’s schools in Amersham as the High School’s Lesedi Nkoane won the girls’ race and also led her team to victory, while Thomas Redmond won the boys’ race for the Grammar School, with The Judd School in Tonbridge claiming team success. Uganda’s world under-20 cross country champion Jacob Kiplimo claimed his third cross country win in as many weeks, finishing 22 seconds ahead of Eritrea’s Aron Kifle (30:22) and Kenya’s Edward Zakayo (30:43). Kenya’s Eva Cherono won the women’s race in 27:20 from her compatriot Gloria Kite (27:30) and Spain’s Trihas Gebre (28:01). Eilish McColgan celebrated her birthday with a win, clocking a course record of 32:39 ahead of Kate Reed in 33:29 and Louise Jackson in 35:07. Callum Rowlinson won the men’s event in 31:36 from Jonathan Carter in 31:52 and Andy Benson in 31:53. In very cold conditions, Edward Cheserek broke the course record for the 4.748-mile event with 21:16 and Celliphine Chespol claimed the women’s title in 24:33. Britain’s Andrew Butchart ran 21:45 for third as he continues his comeback after injury.